Disgraced joyurnalist Mikael Blomkvist accepts an invitation to surreptitioulsy investigate a forty year old unsolved murder on behalf of the victim's uncle, Swedish industrialist Hendrik Vanger. 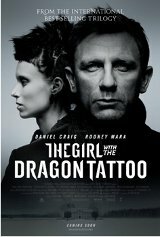 Meanwhile, tattooed hacker Lisbeth Salander, hired to investigate Blomkvist, discovers the truth behind the conspiracy that led to his fall from grace. Thrown together by fate, the unlikley duo uncover a secret history of murder and sexual abuse festering beneath the veneer of Sweden's industrail past, all the while drawing closer to a quiet evil waiting to engulf them both.